Prepare your house for Santa! Christmas Puzzle is rated 3.5 out of 5 by 19. Rated 5 out of 5 by mnkysmom from Great holiday distraction! This is a very simple match 3. I found it most enjoyable because there's really no pressure or rush. Pleasant enough music, and the graphics are pretty cute. Each level can be replayed if need be, and the 'snowing' effect is pretty nifty. No plot, no villans to chase down, no hero to be made! Just a relaxing little holiday M3 to veg out with. Rated 5 out of 5 by Gojira2006 from Deceptively Fun & Difficult As you progress through the levels, it becomes more difficult to thaw the ice & release the gold, as it should be . . . Judicious use of the bombs & rockets, as well as "The Hammer," will release the most stubborn jams . . . ! Awesome game . . . ! 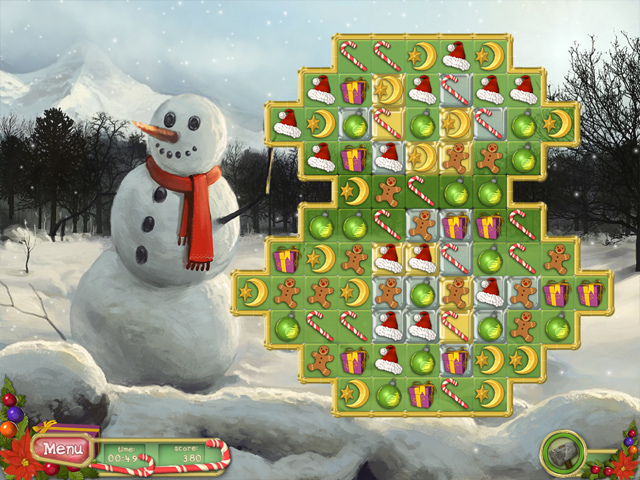 Rated 5 out of 5 by sereneorchid from Perfect holiday distraction A lovely match 3 game for the winter holiday season, with season-themed icons. Animations and special effects are entertaining. The puzzles are relaxing, not mentally taxing, although chained tiles and other challenges are added. 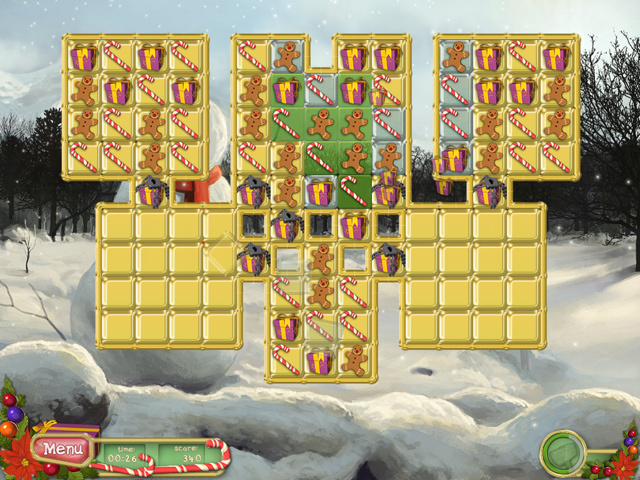 Coins you win by playing are used to purchase outdoor decor for a snow-covered house and yard, allowing you to design your own animated holiday "scene." A simple, but enjoyable chance to be creative. This is a holiday treat for everyone, from kids to seniors. And a quick play at lunch or whenever you need a few minutes to relax. 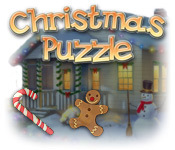 Rated 4 out of 5 by Kimmycoo from Love Customization I really liked this Christmas match 3 game. But what I really love is being able to customize something. In this game you can use your coins to decorate your home and yard. I am so into that! I loved the end result too, it was a gorgeous house once you beat it and all items have been bought! Loved the music and sounds. Great game! Only gave 4 stars because it was a bit shorter than I like. Rated 4 out of 5 by pollyuk2 from Something for after Christmas dinner--match 3 There's really not a challenge here but it's a good after-the-dinner bit of fun! I turned the sound right off(too much for a full stomach). Getting points and making your house all crimbo cardy was a bit of fun so.....go on....if you want to play the usual after dinner game but on your own....wait till they do a deal....and get it! Rated 4 out of 5 by myyorkies1994 from Good for New 3M Players and Kids This is a fun, easy game for those times when you don't want a big challenge. The graphics are good, there are a variety of board shapes that make it interesting, further on you get bombs and rockets to help clear those hard-to-reach corners and ends. The timer counts up, so no worry of running out of time. 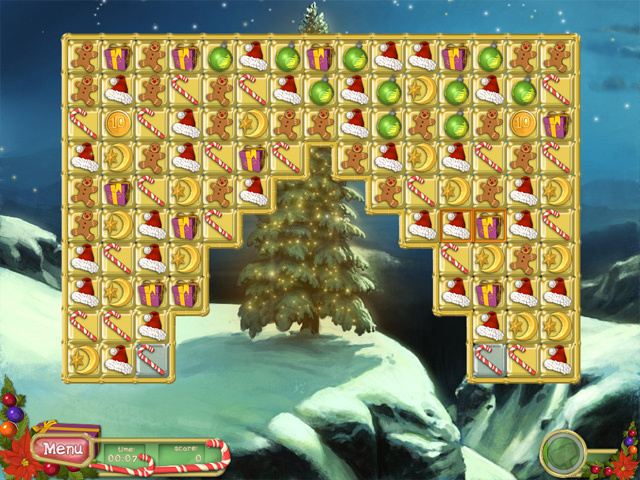 With the points you earn, you decorate your house and yard for Christmas. Hope you love "Joy to the World" as it plays over and over and over. A variety of holiday music would have improved this game immensely! Rated 4 out of 5 by pamhamlet from Cheery Holiday Fun! I liked this delightful game! It is a simple match 3 that is geared toward putting you in happy holiday spirits--perfect for the season. The music is light and joyful, and the icons are pretty and all christmas themed. The powerups are plentiful and animated with exploding effects and sounds. What I liked is that, while the levels do get more difficult as you progress, they are interspersed with smaller, easier grids inbetween so that not every new screen is a wall of difficult chains and blocks to bust. So that provides a break now and then at the higher levels. I took my time and played leisurely over a few days, but I do wish the game had been longer. Once you've completed all the levels and decorated the house, the game is finished, but you can look forward to starting all over again next year! The cozy, wintery cottage you get to decorate using earned coins is quite lovely, with animated smoke in the chimney and blinking strands of colorful lights to place along the rooftop, walkway and trees. I also wished it could have been kept as a screensaver for the holiday season. So, get a hot cup of tea or cocoa and enjoy this plucky little gem! Rated 4 out of 5 by Skari from My Christmastime tradition game This game totally appealed to my enjoyment of both Match 3's and Christmas. Like most Match 3's, this game is addicting. The music is Christmas music (one song is literally "Joy to the World" and another one reminds me of the opening theme to the movie "Elf"#, and it does get repetitive, but you can adjust the volume if you don't like it. The game gets progressively harder, but it adds in some really fun bombs and rockets with which to blow stuff up! You earn points to decorate the outside of your pretty little house in woods. The one thing I didn't like about it: Once everything is decorated, the game is completed. I'm used to Fishdom, Deep Blue Sea, and Big Kahuna, which go on and on and on #for MONTHS, depending on how often you play them#. Granted, you can always begin again, but I would've like to decorate an entire Christmas village. It also would've been cool if it gave you a lovely snowy screensaver of your decorated house once you finished, like on Fishdom. It has replay value - Match 3's are versatile that way - and I've made it my annual Christmas play. Rated 4 out of 5 by Marjoleine13 from Yep! I liked that one a lot! Sometimes it was really tricky, just like I love games to be! Rated 3 out of 5 by deddu from Decorate Your House As other reviewers have stated this is a short, easy match 3. You collect coins to buy preset decorations for your house and yard. I was disappointed that it didn't last very long. Play through awesome levels, collect Santa’s coins and prepare your house for Christmas with beautiful ornaments and illuminations!